Nicola Sharpe is working on a project in science with her friend, Stephanie. As part of the project they make a pinhole camera and take a photo with it. But, when they develop the photo there is something very strange. There is a ghost-like figure in their picture. 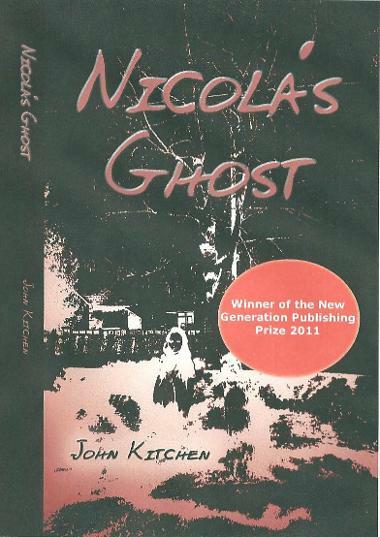 Nicola is excited, because she has always felt there was something strange about her family. She feels that her parents are hiding a secret about her past, and she thinks the ghost in the photo will, somehow, lead her to discover that secret. She and Stephanie follow clues that the ghost gives them in the various photos they take, and gradually it becomes clear that there is a secret in the Sharpe family... and the ghost IS leading Nicola to the truth! Stephanie and Nicola made a pinhole camera. Below you will see the design they used to make their camera. You could make a pinhole camera too. You won't get a photograph, but if you take it outside and look at something that's big and stands out, you will get an image on your tracing paper - and it might suprise you! 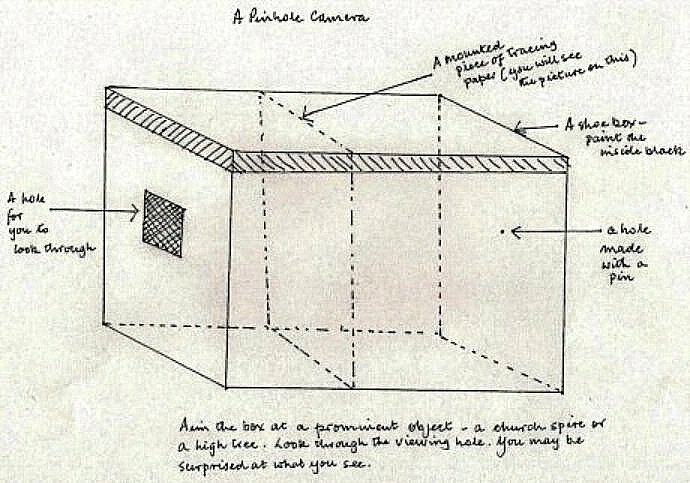 A pinhole camera is a box, a shoe box or something of the same size. The inside has been painted black and at one end, you make a small hole with a pin. At the other end you cut a square to look through, and inside the box you mount a piece of tracing paper. Try it. Go outside and look at a prominent object. You will see it on the tracing paper, but something about it will be different. You will have to be a bit of a scientist to understand why it's different. A clue. It has something to do with the fact that light travels in straight lines ... Think about it! Lloyd Lewis has been moved to Sarson Hall. Lloyd is an Afro-Caribbean orphan whose life has been hard and who has grown up learning to fend for himself. He is not one to be intimidated by anything paranormal, and he sets about confronting the terrors of the Hall. But there is more confronting Lloyd than just a ghost and in a strange way, Sarson Hall makes him confront himself as well as the strange ghost that emerges from the cellar in the Tudor wing of the Hall. His quest leads him into places far more distant than Tudor times. In fact it leads him to the historic magic of Stone Circles and the hidden powers of the earth. With his new found friends, Rudi and Justin, he embarks on a thrilling, life-changing journey and he discovers there are forces in this world that he has never even dreamed of. 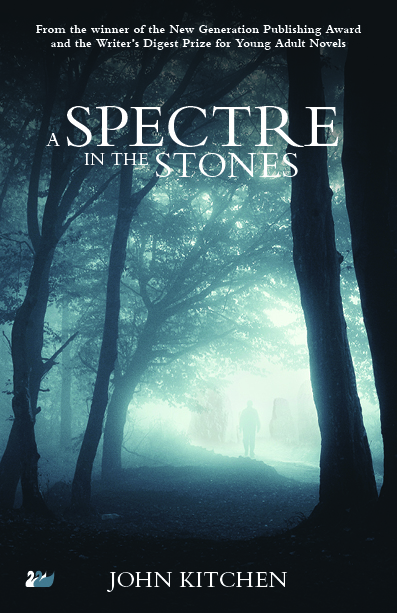 Find out more about A Spectre in the Stones and the great story behind it. All over the world you will find stones like these, put there thousands of years ago. No one knows exactly why the stones were set out as they were, but they are very old and it is generally thought they were linked to the ancient religions. Is it a twig from a tree? Yes, but in the right hands it can be so much more. 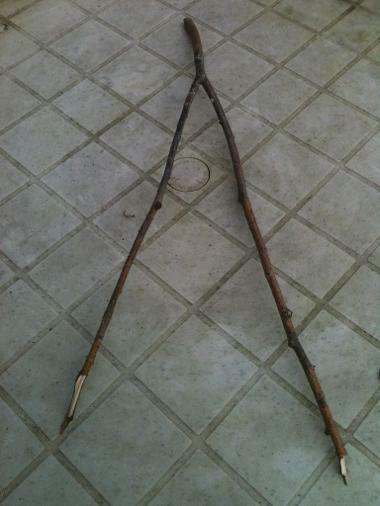 Twigs like these can be used by certain people with special powers to detect minerals and water underground. People who can do this are called diviners, and searching for minerals underground is called dowsing. When the twig detects a mineral under the ground it will bend towards it. The twig is almost like a primitive metal detector. But some people can detect even more amazing things than minerals with their divining rods. They can detect forces in the earth that are centuries old and almost beyond imagination. Running in straight lines across the world, from one ancient monument to the next, hidden underground, are lines of force that hardly anyone understands. They are called ley lines and they carry in them some of the most ancient powers in the world. 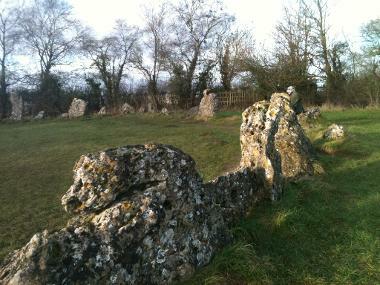 Did the druids, thousands of years ago, know of these forces when they built their monuments? It is generally accepted that you disturb the forces of the ley lines at your peril. Did someone disturb one of these ley lines in 'A Spectre in the Stones'? 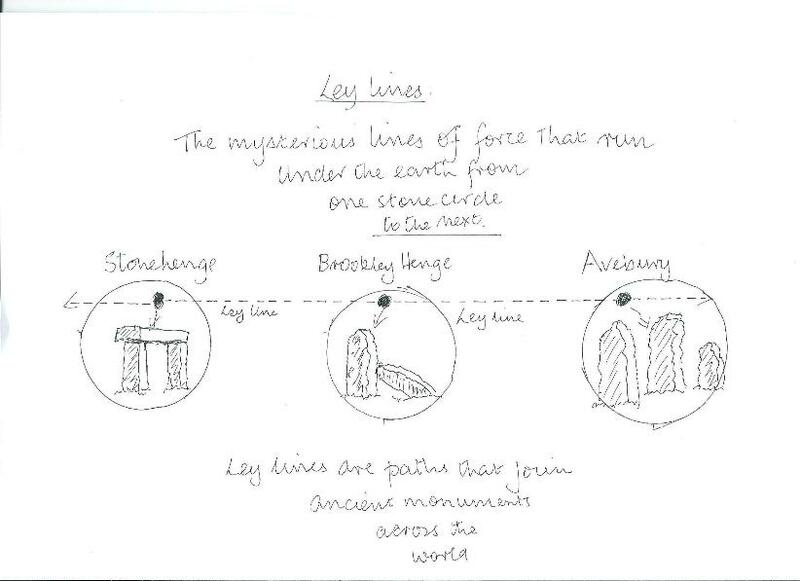 Ley lines run in straight lines from one ancient monument to the next all over the world. This is a story about an Elephant with ambitions. He wants to join the trumpets in the band in town, but, has he the right qualities to be in a band? The story is a heart warming tale about friendship and the encouragement and support friends can give. This is a story about a disc that comes to earth from outer space during a raging storm in India. The disc radiates the rainbow and it has great powers to regenerate and cleanse the world from pollution and disease. But it is a super-advanced CD and requires a super computer to open it. The disc is destined to be kept by a young African boy, Kofi. 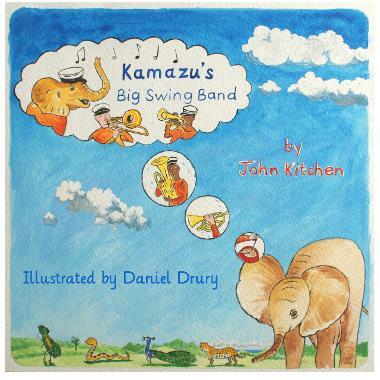 This book is the thrilling and moving story of the African boy's adventures keeping the disc safe. He is able to use its external powers as he grows up. In his early life he is brought up by apes and an Imam and becomes the leader of a primitive and dangerous tribe in Africa. But, in order to unleash the full power of the disc he needs a friend. In the most dramatic of circumstances he meets Jesse Tierfelder, a young American, son of the great Computer magnate, Everett Tierfelder - and the destined future of the Rainbow Talisman begins to be unleashed as the two boys set about finding a way to release its hidden powers. Imagine a house in Cornwall, on a steep hill of very old houses, in a seaside village. The house is narrowly squashed between the other houses, it is tall and the rooms are scattered haphazardly with no one room on the exact same level as another. There is a cellar and underneath the cellar a cavern where water washes in from the sea and the house is bursting with mystery and secrets from the past. 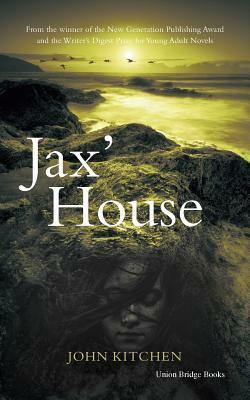 Jack O'Hagan, a thirteen year old boy, comes to live there and the house is determined to share its secrets with him. 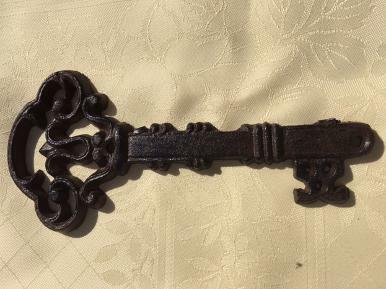 This is a very ancient looking key that Jack discovered hanging in the cellar of the house. It seemed to mesmerise him, so much so that he wanted it by him at all times. It didn't fit any of the doors, but there were occasions when strange things happened in the house and doors became stuck. Then the key seemed to release the jammed door, but when it did, it opened it onto a very different world from the one that Jack knew and understood... and a much more dangerous world. 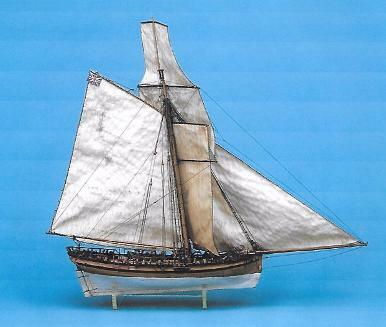 An eighteenth century clipper very much like this roamed the seas of Cornwall in that dangerous world, and its route from France and its purpose in sailing to the coves of Tregenwyth were not entirely to the liking of the dragoons and the government customs officers. Against her will, Martha Jax became involved in the activities of this ship, and through her, so did Jack.